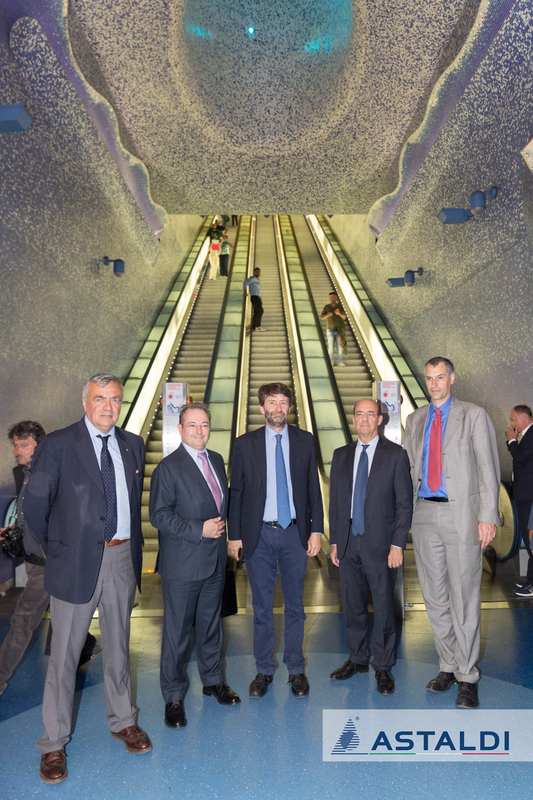 This morning, Astaldi Group’s Chairman, Paolo Astaldi and Deputy Chairman, Michele Valensise, accompanied the Minister of Cultural Heritage and Activities and Tourism, Dario Franceschini on a private visit of Toledo Station on Line 1 of the Naples Underground, together with the Mayor of Naples, Luigi de Magistris. Toledo station, built by Astaldi Group and opened in 2012, forms part of the Naples Underground Art Stations, and was designed by the Spanish architect, Óscar Tusquets Blanca. A unique project that has been on the receiving end of various prestigious awards over the years including the CNN Award acknowledging it as the most beautiful and breath-taking underground in Europe. It comprises tunnels characterised by two large William Kentridge mosaics, the work of the mosaicist, Costantino Aureliano Buccolieri. The first, on the mezzanine level, depicts a typical Neapolitan scene with figures in motion, including the artist and St. Januarius. While the second shows two figures bearing a cart filled with symbols of the 1799 Parthenopean Republic. LED light shows put together by Robert Wilson can be found inside the station, alongside shots by Achille Cevoli and photos by Oliviero Toscani, as well as works by the US artist Lawrence Weiner, the project by the Iranian artist, Shirin Neshat together with photos by Luciano Romano, and ceramic panels by Ilya and Emilia Kabakov which seem to ideally lead to the work by Francesco Clemente, located on the mezzanine floor. 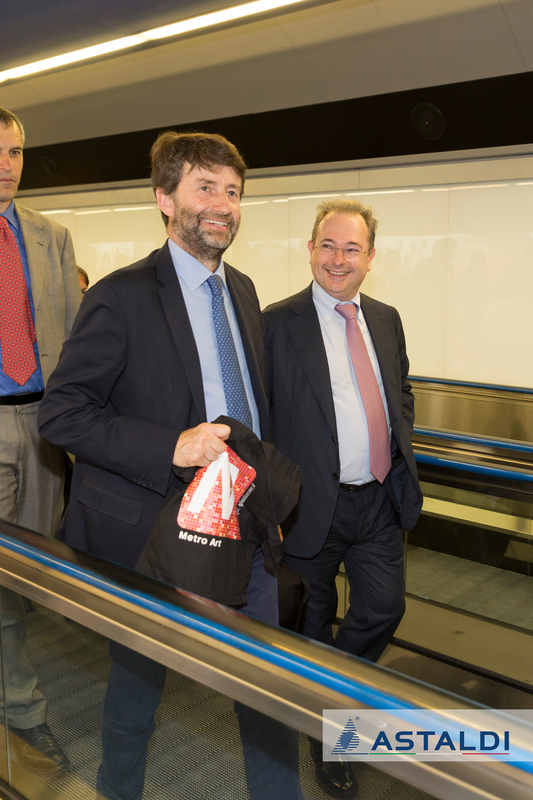 “We are delighted about Minister Franceschini’s visit today and we would like to thank him for the attention paid to a major work for the city of Naples, the artistic and technological value of which is also acknowledged at an international level. Toledo station brings together utility and beauty and represented a major challenge for our Group, both as regards design since it is located in a geologically and archeologically complex area, and aesthetic importance” stated Paolo Astaldi, Chairman of Astaldi Group.